She skipped the bus— too much money— and walked the two miles back to her shabby one-room North Chicago apartment, opting for the alley that shortened the last six blocks to four, ignoring the catcalls from the construction site at the far end. Short, dirty-blond hair styled into an undercut, black, heavy-framed glasses that hid soft blue eyes, and baggy pants that masked what little curve her large-boned frame had managed to achieve. She wore a loose t-shirt over her top-half and a ball cap with a brim bent much like her current attitude. Cent was skinny but strong nonetheless, a tough-as-nails Appalachian woman, a concept no one in North Chicago seemed able to grasp. Those idiots will whistle at anything on two legs. Forget that. Take me as I am or not at all. Cent kicked off her shoes and rolled so she faced the cracked, plaster ceiling. She’d graduated top of her class at the University of Chicago and knew account management inside and out. Born and raised in the foothills of the Appalachian Mountains, Science Fiction and Fantasy author Jeanne G’Fellers’ early memories include watching the original Star Trek series with her father and reading the books her librarian mother brought home. Jeanne’s writing influences include Anne McCaffrey, Ursula K. LeGuin, Octavia Butler, Isaac Asimov, and Frank Herbert. Jeanne lives in Northeast Tennessee with her spouse and their five crazy felines. Their home is tucked against a small woodland where they regularly see deer, turkeys, raccoons, and experience the magic of the natural world. Jeanne’s first series, The Taelach Sisters Series, won two Golden Crown Literary Awards for excellence in Speculative Fiction and was short-listed for a Lambda Literary Award. 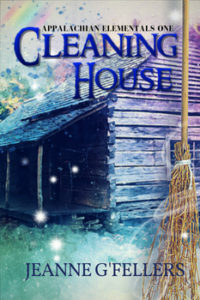 What was the inspiration behind Cleaning House? For me, Cleaning House is about returning home to Appalachia where I was born and raised. It’s about family. It’s about all the things I live around and appreciate most about my community. It’s about being queer within the unique culture that has developed in the Appalachian Mountains and the resilience of the people there, especially the minorities. Cleaning House is also about Nature, about respecting and understanding Nature and the magic that rests in ancient places like the Appalachians. We haven’t been kind to these mountains during the last 200 + years, so it only stands to reason that they’d be reluctant to speak with us. And, for that matter, what would they want to say? What would the land want to discuss? Would it speak about the pain coal mining and logging has inflicted on it? Would the rest of the elements, meaning air, fire, and water, have anything to add? And would we listen? What is your writing process? I drag through my first drafts. I hate writing them, getting the story down for the first time. My initial drafts resemble screen plays. Action. Dialogue. I much prefer rewrites. That’s where all the little things happen. For me, it’s where a story really comes to life. You see, I’m an onion writer, meaning that I write in layers. Each pass through the manuscript means more details, more intricacies… more of the things that make for a good story. There’s a big leap a writer takes from putting words down on paper for the love of it and actually publishing those words for public scrutiny. What was that journey like for you? For me, writing to publishing isn’t necessarily a leap. It’s more of a steady progression. I write first and foremost for myself, to get stories from my head to paper (or computer file in my case). It’s my coping mechanism, my safe place. Writing is about the fun of creation. It’s art in a form I can still manage. I can’t not write, so I share every piece when I think it’s ready, and every novel-length work I’ve written has found a home and an audience, no matter how small that audience might be. What piece of advice would you give an aspiring writer? Find your writing tribe and hold them tight. It’s a tremendous relief to find those who think like you. And finding your tribe has nothing to do with genre. It’s about process. It’s about understanding writerly rants and laughing at your own and others’ mistakes. Find those you can think out loud with and can take constructive criticism from. What can readers expect from you next? Readers can expect a yet untitled novella from my Surrogate series later this year, the next novel in the same series, Surrogate: Traditions, in 2019, and the sequel to Cleaning House, Keeping House, summer 2019. In other words, I’m keeping busy. Least favorite endearment: Sugar Booger – ugh. I’ve heard it many times before, and I loathe it. I think it’s a southern thing. What a sweetly disgusting thing to call someone. To my ears, it sounds as passive-aggressive as can be. Sleep with your socks on or off: Off in the summer. On in the winter. I like toasty but not overheated. Ask for permission or ask for forgiveness: Permission. Always ask first. It’s a matter of respect. The author is giving away a $10 Amazon Gift Card. Jessie G Books does not have access to any information gathered in this rafflecopter.